A wicked dressing file indeed! In this installment, we take a look at the nests built by harpies, with the 10 approaches presented including stunted bushes, scattered bones and bloody pieces of garments, hinting at the savagery of the things to come. When reaching the nest, PCs may be greeted by one of 10 current events – like harpies gnawing on partially decomposed bones, snoring the sleep of the unjust…or just being lonely, which may delay the inevitable hostility of these vile beings, Tenderizing a corpse with a club was a mental picture that really made me gulp. As far as features are concerned, we have revolting layers of slime covering everything, excrement-covered half-eaten bodies (ew!) and wall decorations of splintered bones. Really cool! 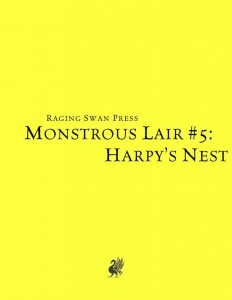 The pdf also contains 10 minor features that include scratch-marks and piles of moldering equipment, sharpened twigs that may carry diseases…and depressions containing eggs, one of which is broken open, showing the metaphysical concept of perverted motherhood resounding through the myths of the harpy. As far as appearances are concerned, 10 entries are provided, and they include wicked beaks, beautiful parrot-like plumage, livid scars or a mane of hair interwoven with bone fragments. The pdf also sports 10 treasures to be found, which include brass scissors, lockets containing lewd pictures, a folio of songs, a statuette of a wrecked horned, Pegasus (minor complaint: pegasi, per default, do not have unicorn horns in the tradition of D&D-based games). There also are 10 trinkets included, which include bent and rusty spikes, shards of broken blades and eye-catching belt buckles or open coffers – all stained or shredded. Harpies evoke images of stained purity, of perversion and cannibalism, of a corruption of the domestic sphere and the virtues of femininity once aligned with them; that is why harpies resonate with us to this day as something intrinsically wrong. The associations with filth, cannibalism and excrements make them disturbing and disgusting in equal measures, and this pdf by Creighton Broadhurst perfectly encapsulates these notions, making this an amazing little offering, well worth of 5 stars + seal of approval.